My name is Miss Thomas and, as the Achievement Leader of Transition, I want to welcome you to King Edward VI School in Lichfield. Going from a small primary school to a large secondary school like ours can be a big change. Pupils are expected to be more independent, self-reliant and self-organised. Most pupils welcome this but some can find this very difficult to cope with. As part of my role, I aim to make the transition from primary school into secondary as smooth and as enjoyable as possible. This process starts in Year 6. Our school website will offer as much information about the school and the transition process as possible. After National Offer Day in March we begin a comprehensive liaison programme. We aim to meet every child in each primary school. By working closely with our primary colleagues, we try to ensure that the individual needs of pupils are identified and met at an early stage. An Open Evening is held early in the Autumn Term – parents and the new Year 7 pupils visit us and meet our teaching staff, pupils, visit the buildings and more. 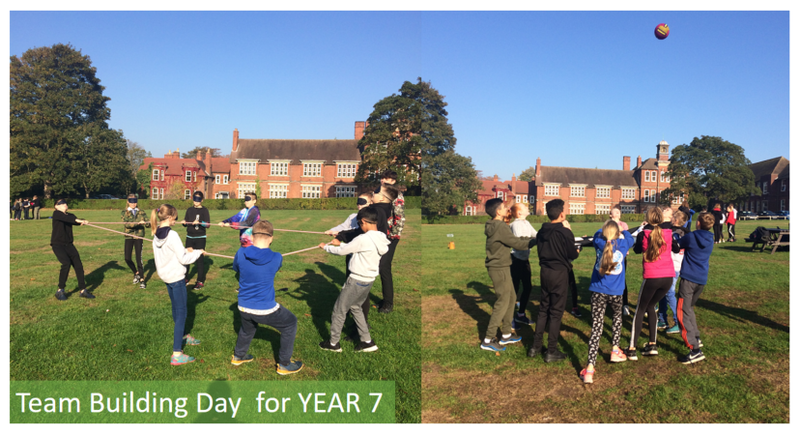 Induction Days are held in June; this is a key opportunity for all Year 6 children to get a taste of secondary school life. Parents are invited to an Information Evening following the two Induction Days. For parents and pupils who have extra concerns and worries over transition, we offer extra transition days for smaller groups in late July. Following your child’s admission to King Edward VI, we hold a ‘meet the tutor’ evening during September. Being bullied. At King Edward VI, we do not tolerate bullying and actively promote our RESPECT code of conduct between pupils. If bullying does take place, then we are very quick to act upon it. We encourage pupils to tell a member of staff and issues will be dealt with quickly and effectively. Furthermore, there is an anti-bullying group run by some of our sixth formers at lunchtime which acts as a safe place for pupils to go to, talk to others and have fun. Not making friends. We have a large number of catchment schools so there are many pupils who come to us not knowing anybody else. At King Edward VI we are quick to recognise this and dedicate parts of the transition days and the first day in September to group work and getting to know each other. There are several lunchtime clubs that encourage pupils to make new friends and there is a nurture group set up if pupils really are struggling to make new friends. Getting lost. King Edward VI is a big school and all pupils (and teachers) sometimes get lost. This is all part of transition. Pupils will have a map of the school on their first day and will be taken on a tour of the school. Furthermore, our pupils and staff are very polite and will always help you find the place you’re trying to find. Homework. At first it will seem like there is a lot of homework from a number of subjects. Some weeks there may be a lot, and other weeks there may be less. It’s important that you find time at home to do your homework well and on time. The student planner will help record and monitor homework. Not being able to do the work. Not all pupils will find the work easy and there may be subjects you’ve never done before but this is normal and to be expected. Teachers are always willing to offer support if you do not understand it. Many subjects offer intervention to support those pupils who struggle. Travelling to school and back. Most pupils have to travel further to get to King Edward VI. Some will be making their own way to and from school independently and others will be travelling by bus or train. Not having the right books and equipment. Being organised is crucial for secondary school, but is something that pupils don’t find easy or may take a while to develop. There are consequences for forgetting books and equipment but making sure that your school bag is packed correctly every evening will help. Not knowing what to do if there’s a problem. Tutors play a vital role in transition and are normally the first port of call with any problem. They will know what to do! Not getting on with the teachers. There may be some teachers that you don’t get along with. However, we are unable to change which teachers you get and it’s an important life skill to find ways of getting on with teachers and still following the rules. Getting into trouble. Most of our pupils are very well behaved and well mannered. However, some will find themselves in trouble. We have a point system where pupils can gain and lose points. For poor behaviour, there are different point losses and various sanctions depending upon the severity of the behaviour. Click here for details of 676 – our very own Year 6 Transition Reading Challenge run by the Library Resource Centre.